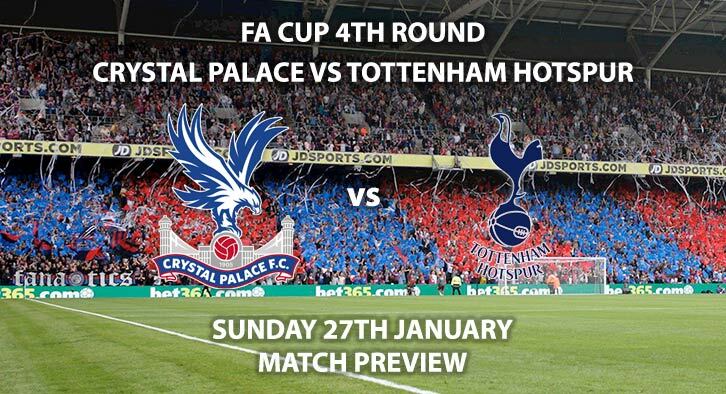 The FA Cup fourth round has treated us to an all Premier League affair as Crystal Palace host Spurs. The London derby will see two clubs whose league campaigns have fared rather differently so far. The hosts are currently 14th and checking their shoulders to avoid a relegation scrap meanwhile the visitors are pressuring the top two in 3rd place. Both sides were fortunate to have rather easy third round draws. Crystal Palace saw off Grimsby whilst Tottenham thrashed Tranmere 7-0. Crystal Palace are priced at 7/4 to win by SkyBet. The home side enter the match on the back of an incredible match with Liverpool in the Premier League. They lost 4-3 however have showcased in recent months their ability to battle with the best. Whilst goals have come at a premium for Roy Hodgson’s side, one man has been a reliable source of goals from the midfield. Luka Milivojevic has scored six goals for Palace in the league this season and is a threat from any set piece situation. He could be the key and is 12/5 top score anytime. This match will be on a knife edge. The home side will feel confident in a victory being possible due to their opponent’s injury issues. SkyBet have priced Crystal Palace to win 1-0, 2-0 or 2-1 at a tempting 11/4. Tottenham are priced at 6/4 to win by SkyBet, who are struggling to decide a favourite. Spurs have been riddled with injuries and absentees in every position they wouldn’t have wanted. Harry Kane, Dele Alli, Hueng-Min Son, Lucas Moura, Victor Wanyama and Moussa Sissoko are all unavailable for the match. With the injury crisis, pressure is now on Fernando Llorente to deliver the goods. The Spaniard bagged a hattrick in their last FA Cup match and is 9/2 to score first. It could be a tough match to get the upper hand in and one moment could settle the odds. Spurs are priced at a tempting 7/2 to win to nil. During the Premier League season, Crystal Palace have been the more abrasive of the two sides. They have averaged 19.1 booking points per match whilst Spurs have only averaged 13.8. Crystal Palace vs Tottenham Hotspur will be televised on BT Sport 2 and BT Sport 4K UHD and kicks off at 16:00. It will be tight and tense however a win would mean more for the hosts than the visitors. Correct score: Crystal Palace Win 1-0 – (link no longer available). Anytime Goalscorer – Luka Milovojevic – (link no longer available). Correct Score Group Betting – Crystal Palace to win 1-0, 2-0 or 2-1 – 11/4. Price Boost – Fernando Llorente to score a header – 11/2. Popular RequestABet – Eriksen to score from outside the area and Crystal Palace to score a penalty – 100/1. Popular RequestABet – Everton to win, BTTS, 4+ corners each team and 20+ booking points each team – 18/1. Odds and markets last updated on Sunday 27th January 2019 @14:32 GMT. Remember to keep visiting the tips and preview area for further updates and betting previews around this weeks domestic action.